Party DJs and Children’s Entertainment in South Wales. It was definitely a month of party discos. We had an 18th birthday party at the Mile End Pub, 30th birthday party Ford’s Club, and a 50th birthday party, Manselton Hotel, all in Swansea. We were DJs at an engagement party at the Deri Arms in Cardiff, and a wedding at Neath RFC. Here’s more news with the Children’s Show. This was a very busy month for children’s entertainment. We had bookings in a variety of locations in South Wales, which included: Riverside Holiday Park in Swansea, New Minerton Holiday Park in Tenby, Brownhills Caravan Park near Llandysul and the Jubilee Club in Pontardawe. 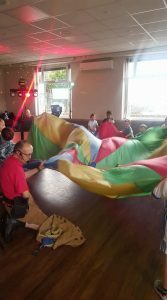 We entertained at a Christening Party at The Halfway Pub in Swansea and had an outdoor Fun day at The Black Boy Pub in Swansea. We’ve had quite a varied selection of discos in South Wales this month. Tom and Martin have been Wedding DJs at The Plough, Rhosmaen, Llandeilo, Swansea Yacht and Sub Aqua Club, The Beggar’s Reach, Milford Haven and the Castlemead Hotel, Tenby. 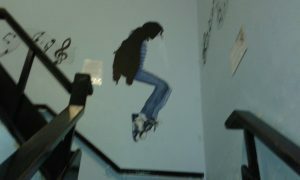 We created a good atmosphere by playing a wide range of music. At some of the events we had to stick to a strict playlist. This can work well, as it can contain a good mixture of pop, rock and other genres of music. Martin, Kelly and Ethan had their annual outdoor event near Carmarthen, i.e., Abergwilli Carnival. It was a chance to play all the summer tunes. We were very lucky with the weather this year. Dry and sunny. It was torrential rain last year! 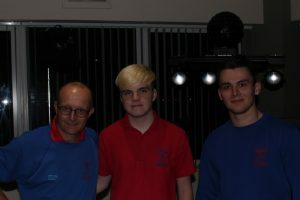 Ethan and Martin were DJs in Teenage disco in Swansea, at Ostreme Hall, Mumbles. We made sure all the requests were played together with the latest hits. They were Prom DJs in Neath at The Disco Glyn Clydach Coach House. The year of 2017. Everyone had an amazing night! There was also a Children’s Disco in Swansea. It was a football presentation disco for the football under 6’s. 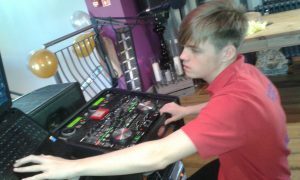 Ethan was the DJ at Morriston RFC. He played popular songs for the children and request, and Martin was the Children’s Entertainer in the Swansea venue. The best thing I did was to invest in a new camera! The clarity of the images and the richness of colour of the photographs really show the disco lighting we use at its best. We believe that having a good light show in a disco enhances the atmosphere of the event.Don’t forget to visit our You Tube Channel: DJ Diamond Dust. We travelled to Carmarthen this month to DJ at a birthday party in Johnstown area. We have worked as a DJ in Tenby, done a few weddings in Swansea and a few football presentations in the Swansea and Neath area. 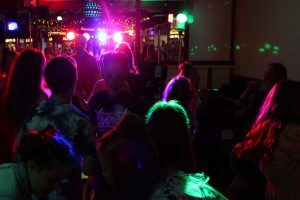 June has been primarily discos, including a joint 30th and 50th birthday Party at Carmarthen Athletic Club and 30th birthday party at Mumbles Cricket Club. We have had a few wedding discos in Swansea, such as, Swansea Yacht and Sub Aqua Club and a wedding at the Village hotel in Swansea Football presentations for the under 7’s and 8’s at Bonymaen RFC and the primary school age for Coedffranc Football Club, which was held at Neath Leisure Centre. The regular summer season children’s entertainment and family disco at New Minerton Holiday Park. I’ve recently bought a new digital SLR camera and joined a local camera. This will definitely improve the quality of pictures on the blogs and have the opportunity to improve my photographic skills! 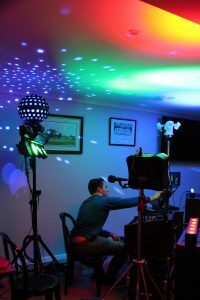 DJ Mart testing new lighting rig. It has been a busy May. 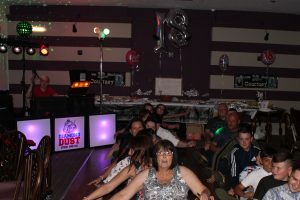 The discos include a 40th birthday party in Cardiff, at the Discovery Pub, 50th birthday party at Uplands RFC, Swansea and a 25th wedding anniversary at the Welcome Inn, Tonypandy. We have had a few presentation nights, a dance school awards night, at Ystradgynlais Welfare Hall and a rugby presentation night at Birchgrove RFC, Swansea. There was a christening party disco with a children’s show at Samlet Club, Llansamlet, Swansea. We have continued with the upgrading with our equipment, both lighting and sound. There are still a few improvements we are in the process of doing. The robots both Mascot the Robot Dog and our newest robot, our 8-Foot-Robot-Cat, are having work done on them. More work will be done in the next month to complete the improvements. We are looking forward to the summer, where shows and discos will be from all areas of South Wales! April has had a mixture of bookings. We have been DJs in Cardiff at Roath Sports and Social Club for an engagement party. Tom and I had a great night with a 70th Birthday Party Disco and backing The Fabulous Voice Tones at the Thomas Arms, Llanelli. The summer’s arrived. We had a return season yet again to New Minerton Holiday Park in Tenby. We have provided a Children’s show in Ammanford, a 5-year-old birthday party in Tumble Hall. 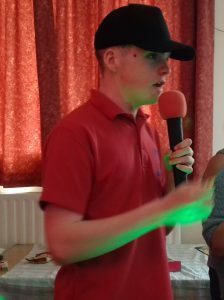 Ethan was the DJ and I was the children’s entertainer at a Children’s Valentine’s Disco in Longford Memorial Hall, Skewen and a Christening Party in Pontardulais Conservative Club. 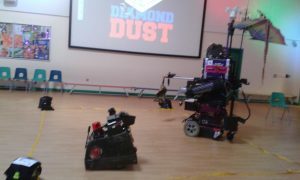 We have done two robot days in Cardiff schools, which were Ty Gwyn Special School and Woodlands High School. The pupils were really enthusiastic and keen. It was a real pleasure to teach and entertain them. The teaching and support staff were very welcoming and helpful. Thanks guys! 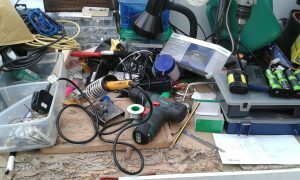 We have just had our Annual PAT testing. We have upgraded some of our lighting system which uses less electricity which now makes it making it more environmentally friendly. March has been the month of discos, primarily birthday discos in Swansea. These have included two birthday party discos in Gorseinon. These were a 80th Birthday Party in the New Lodge Social Club, Gorseinon a 50th birthday Party at Loughor RFC in Gorseinon. There’s more about the wedding disco in Port Talbot. 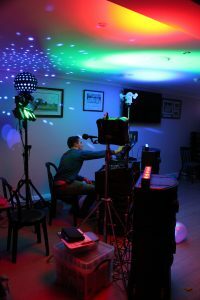 The 80th birthday disco included a very wide range of music requests included Ballroom Music or Strict Tempo as it is sometimes known as. 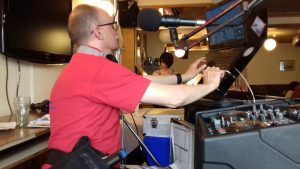 We also played songs from the Fifties, Sixties, Seventies and Eighties, as well as a few requests from the Charts. The 50th birthday party was quite a contrast. Most of the night we played music from the 80s with some current hits. The other birthday party disco in Swansea, Upper Killay RFC, was a range of 70s, 80s and some hits from the 00s and 90s at it was a 50th and 30th birthday party disco in Swansea. 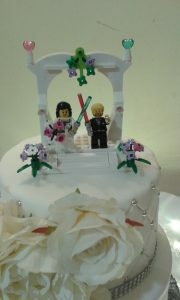 Our Wedding discos, this month included a Star Wars theme at the Aberavon Beach Hotel. The wedding cake was included in the theme. Our Wedding DJ services were required at Ammanford. It was at Betws RFC. There was even a white LED dance for then guest. There are more discos happening next month. There will be Children’s Birthday Parties ahead, and our 8-Foot-Robot-Cat will be making more visits after an extensive rebuild. Keep watching our Facebook pages! 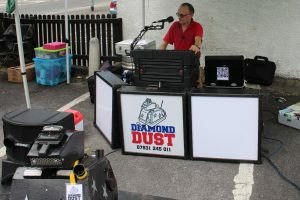 DJ Diamond Dust has had mostly discos in Swansea this month including a 40th birthday party in Bonymaen RFC, Swansea and an 11-year-old birthday party at Tino’s, in Wind Street, Swansea. We were wedding DJs at Heathfield Club, Swansea and The Oyster Lounge in Mumbles. 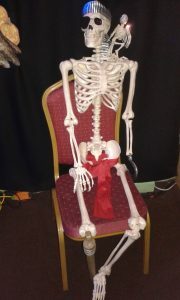 We also did an annual dinner dance at the Halfway Inn, Nantgaredig, Carmarthen. 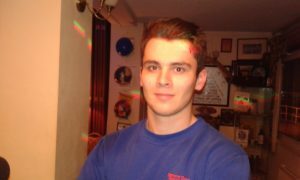 Our children’s discos included children’s entertainment and DJ in Neath, namely Longford Memorial Hall, Skewen.Tom Hyatt has been the DJ at the adult discos, Ethan Gray has been the DJ at children’s disco and shows, while Martin Thompson has been a DJ and a children’s entertainer in Swansea. Kelly Jack Roberts has been very supportive in helping to repair the sound and lighting gear. After the busy Christmas Season and the half term school holidays, we have a break. This gives us time to plan and prepare for the year ahead. 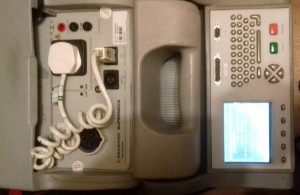 This includes maintenance of equipment, preparing for PAT testing and upgrading some of the kit. Another month or so and British Summer Time will be with us. I am hoping for some warmer, drier weather, definitely more sunlight! It is time to start checking out our 8-Foot-Robot-Cat. There has been quite some interest from schools and universities with our robots. I’ve got a link to a recent newsletter. So time to get her ready! See you next month. We are Diamond Dust, DJ’s in Cardiff and Swansea with Children’s Parties and entertainment in Cardiff, Swansea, Tenby and Neath. Here’s the Crew’s Reviews of 2016. 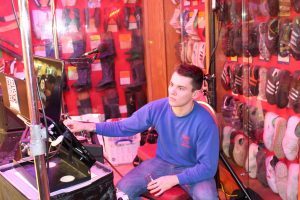 DJ Kelly Jack Roberts: “2016 has been a blast with DJ Diamond Dust. I started off at Maplin Electronic Store in Swansea, then a school prom in Newport Gwent and also a carnival in Abergwili, near Carmarthen. Not only have I been to new places: but I’ve met new people such as other members of the Diamond Dust crew and the Radio Freeway crew. 2016 has been such an amazing year for me and for DJ Diamond Dust and we all cannot wait to see what 2017 holds for us”. 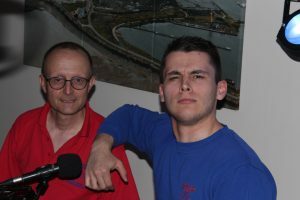 DJ Martin Thompson: “It has been a rich and varied this year. 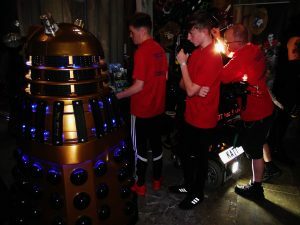 We have travelled throughout South and Mid Wales – even as far as, Milton Keynes during the summer to meet Mat Irvine, the creator and developer of Doctor Who’s K9. We have made visits to quite a few holiday parks; our most frequent visit has been to New Minerton Holiday Park, Tenby. We always have a warm welcome. 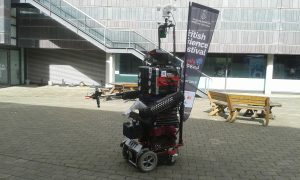 Our 8-Foot-Robot-Cat has visited a few interesting venues including a day at Waterfront Museum, Swansea – Festival of Science week. Rhoose Social Club, near Cardiff was one of my favourite children’s birthday parties. I have not been there before but we had a great mixture of ages of children with different tastes in music and really enjoyed the magic show and joined in to keep Mascot the Robot dog company”. 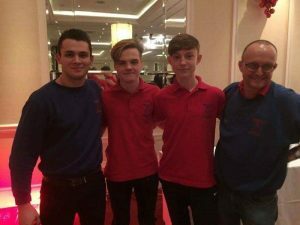 January Discos in Swansea and Neath This month gigs included a children’s birthday party at Carnegie Hall, Skewen. 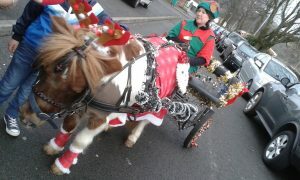 I was a Swansea Children’s Entertainer again – a repeat from last year a very welcoming happy interactive party. 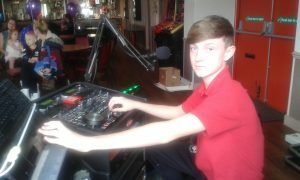 Ethan was the DJ at this venue in Neath. 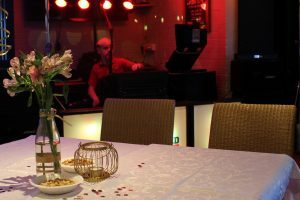 The Naval and Military Club, Port Talbot was the venue of a 40th birthday party, being a DJ in Port Talbot, keeping up with the party songs and hits. 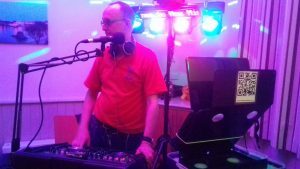 We were DJs at Swansea Uplands RFC, Upper Killay, was a mixture of young audience at a 21-year-old birthday party with plenty of lively dancing from the parents and their friends as well. It was really great to meet up with friends we had not seen in a while, a good time to catch up. I was a Children’s Entertainer at Neath Scout Hall. It was the venue for a 5-year-old birthday party with some fancy dress and a very active party – great fun! Tom and I were DJs in Cardiff at the Discovery Pub – a 21st birthday and amazing fancy dress costumes. We had 62 requests – we did our best to play the majority of them. We played 80s hits and present day chart music. It’s a brilliant pub with a great atmosphere. Thanks guys! 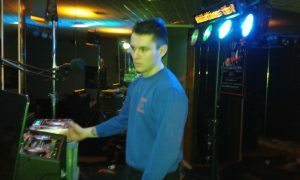 It’s been a very busy month for discos in Swansea and Carmarthen venues, such as the Halfway Inn, Nantgaredig. Tom, Kelly, Ethan and I have been doing quite a bit travelling. 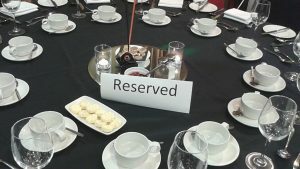 The largest Swansea venues we have done this month were the Marriot Hotel and the Liberty Stadium. We have done children’s Christmas Parties in Burry Port British Legion, Hibernian Band club in Mountain Ash, Cwmavon RFC, near Port Talbot, The Prince of Wales, Porthcawl, and a few for St John Ambulance in Neath and Loughor near Gorseinon. We have even done a few children’s birthday party discos and show in Cimla Community Centre, Neath RFC. Next month, we will do the review of 2016 gigs; meanwhile, we hope you all have had a Merry Christmas and wishing everyone a Happy New Year! Halloween Discos, Firework Night and Videos. This has been a very interesting month. There has been so much variety of gigs going on! This month has included Children’s Halloween Parties in Burry Port British Legion near Llanelli, Croeserw Sports and Social Club near Port Talbot, The Prince of Wales Pub in Porthcawl, Longford Memorial Hall near Neath and Ogmore Valley Primary School. We had a lovely evening with a post Wedding disco at the Beach Hut Café, Mumbles Pier near Swansea. We had a panoramic view of all the fireworks across the whole of Swansea Bay and Port Talbot! We had a 70s themed night at the Cricket Club in Neath which was very entertaining for all. 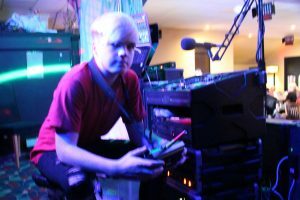 DJ Diamond Dust had a great lively evening in the Village Hotel, Swansea where a Bikers group had their annual celebration. They could not be more hospitable and welcoming. It was a really memorable night. We had a return to the Wig and Pen in Swansea for the locals. It was really great to see old friends for a 21st Birthday Party in the newly refurbished function room at The West Cross Inn, Mumbles, near Swansea. There was a return to Stebonheath Football Club, Llanelli, for a Special Needs Children’s Christmas Party. It was good to see how they were since last year. Another children’s party was a 9th birthday party at Seven Sisters Welfare Hall – what a beautiful hall! It was originally a swimming pool has been converted into a function room and a library. We had a school disco for a transition year at Dwr-y-Felin Comprehensive School, Neath. It was great to let out all the special lighting effects for this teenage disco. This month has been learning about making videos on YouTube for readers to have a fuller picture of who we are and what we do, including Mascot the Robot Dog. Go a visit our YouTube Channel DJ Diamond Dust. Hope you like it. We also include some other videos which might entertain you and put a smile on your face.